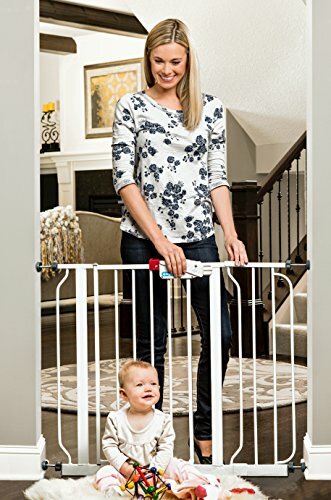 Baby proofing home checklist helps you to baby proof or child proof your home or house for safety as this is necessary when babies, toddlers or little kids and children are around. Here is a helpful baby proofing home checklist for you which will help you to buy and install the right baby proofing products for your home. Many times parents overlook the dangers inside their own homes just because they don't often think like their own little kids. Toddlers always want to play and have fun and they cannot see if something is not safe for them. Childproofing or baby proofing is the act of making an environment safe for children. I thought a lot about this subject when I had my first child and took some measures to make sure my home is safe for my child. This gave me some peace of mind with out worrying too much about his safety. Now that I have a toddler and a new baby, I am again thinking about new strategies to childproof my home. The statistics from around the world show that many children under the age of five get into accidents inside their own home. The major danger zones include stairs, bathrooms and kitchens and many of the accidents happen from falling or drowning. If you have stairs in your home, consider installing gates at the top and bottom of the stairs. Make sure you install the gates properly. Some toddlers can actually manipulate the safety gates, so you have to see yourself that your child is not able to unlock or climb through the gate. To avoid slipping, make sure nothing is spilled over the stairs and also never leave any toys or other objects in the stairs. Never allow babies and toddlers to use stairs without adult supervision. 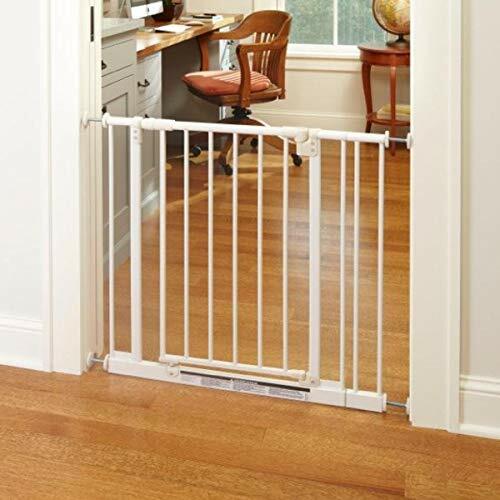 You can use child gates to prevent access to kitchen, stairs or other areas as you wish. Child gates can be installed by drilling the walls or alternatively you can use a child gate which can be pressure mounted. The gate shown below is pressure mounted and easy to install. I stayed in a rented house and I was not allowed to drill the wall to install the gates, so I bought this one. I installed it next to the main front door since my son could easily open the front door. You can find information on baby fence towards the end of this page. To avoid drowning, make sure that you never leave your baby or toddler in the bathtub alone, even if the door bell or telephone is ringing. You can either choose to ignore the calls or take your child along with you if needed. During the bath time, make sure that the child is not playing in the tap with hot water. 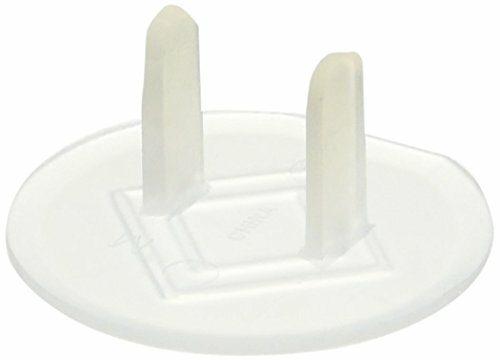 You can use non slip mats in the bath tub to avoid slipping. Electric shock from electrical outlets is another major risk. 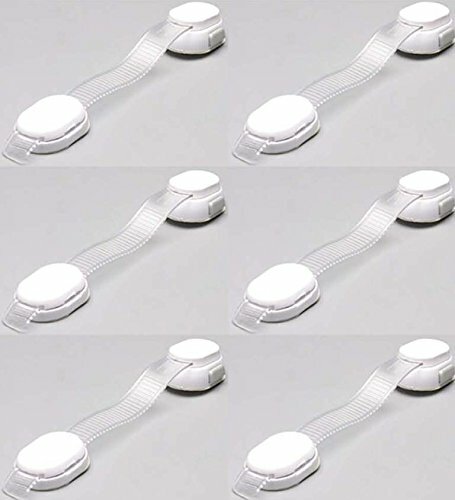 If there are electric sockets reachable to babies and toddlers, make sure you cover them with childproof outlet covers. You can also consider using an RCD protection (GFCI or ALCI). You can use furniture like sofa or cot to cover some areas with unused electric sockets. And never allow kids to play with chords connected to the electric sockets. I have heard about incidents where children put the end of the mobile phone chargers in their mouth and got electric shock. Beware of your heavy TV and unstable furniture. There have been reports of children injured in 'tip over' accidents. This happens when a child pulls a TV or furniture and get caught underneath. If you have a light weight flat-panel TV, you can wall mount it. Furniture Anchors and TV straps can be used if you think your furniture and TV pose a risk. All medicines and chemicals including dishwashing liquids and detergents should be kept out of reach of children. Also see if your indoor plants are toxic. Childproofing kitchen is very important. Always keep hot liquids like coffee out of reach of children. Place pots and pans at the back of the stove and make sure kids do not play with the stove knobs. You can use childproof locks for kitchen cabinets. Always make sure you keep knives and cleaning products out of reach of children. Little kids are tempted to pull over the table cloths which can cause spilling of hot liquids, so it is better to use just place mats. Consider keeping your fridge locked. 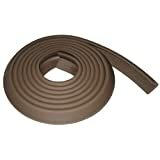 These multi purpose straps can be used to lock cabinets, refrigerators and even dishwashers. Toddlers often play with the doors and cupboards and get their fingers hurt. Try to keep your drawers, cabinets and cupboards locked with childproof locks. Locking cupboards is more important because young children may try to hide inside cupboards which can be dangerous. Once when my first child was about one year old, he put his head inside a small kitchen cupboard and he couldn't take his head out of it. Luckily I could help him. It was a small cupboard adjacent to the wall and it was not possible to lock it any way. I stuffed the cupboard with cardboards and thermo coals and made sure my kid cannot take them out. This is something I found really helpful, in fact it was a lifesaver for me. Toddlers like to play with the doors and they can get locked inside. It depends on the type of door to decide if you can actually install locks on top of the door which kids cannot manipulate. 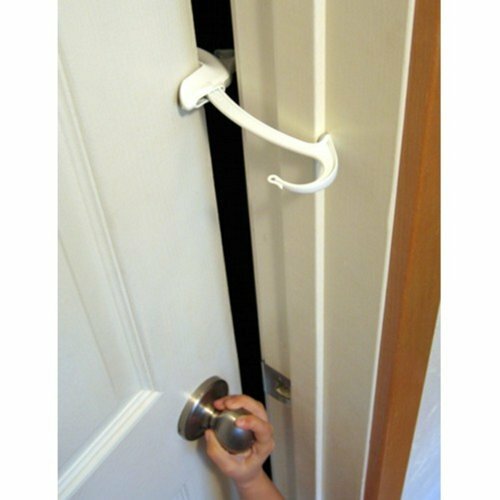 If it is not possible to install new locks, buying this door monkey can really help. This product is suitable for standard 1.38" thick doors. Check yourself to see if this product suits for your door type. When you close the door, it automatically locks the door, but there will be a partial opening which helps circulation of air. You can easily install it with out any tools and you can also remove it when ever you want to. If you have furniture with sharp corners you can consider using edge and corner guards. If you have small babies, never leave them in bed unattended with stuffed toys or pillows or anything babies can suffocate. Choking Hazard is another thing parents need to be careful about. 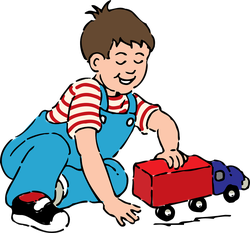 Avoid toys with small detachable parts for kids less than three years of age. Always buy age appropriate toys. Also be careful about other small objects and foods like nuts, grapes etc. Always follow the six inch rule for strings to avoid the risk of strangling. Never allow children to play with the washing machine. Make sure your kid's crib, high chair, bouncy seats, toys, car seats and strollers meet the national safety standards. Always read instructions and use safety straps. Keep first aid kit and emergency numbers handy. Baby fences are like little play zones for your little one. The Little Playzone has an activity board with colorful spinning balls, play phone and light-up musical keyboard and it has a swinging hinged with safety lock. 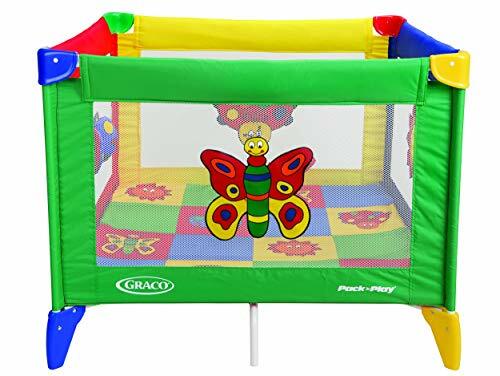 Additional connectors and walls can be bought separately and added to expand the size.The Graco Playard provides a square play space and it can be easily folded. Both the above products can be used to provide a safe place for babies. All these information and products for childproofing help us in taking care of children in a safe environment, but the most important thing that we always need to make sure is to never leave children unattended. I am always looking forward to new ideas on this topic, so if you have any suggestions or if you think I missed out anything, please tell me. I will be pleased to know! @evelynsaenz Thank you, that's a good idea! Actually it is a concern how to handle the toys of my toddler since those can cause a choking hazard with my younger one around. The Legos are all scattered in the floor most of the time. Thank you for this suggestion. Great tips for new parents. Childproofing your home is essential. Now that you have two children I would like to suggest another tip. Instead of putting your baby in the playpen, use the playpen as a safe place for your older child to play with small objects such as Legos. 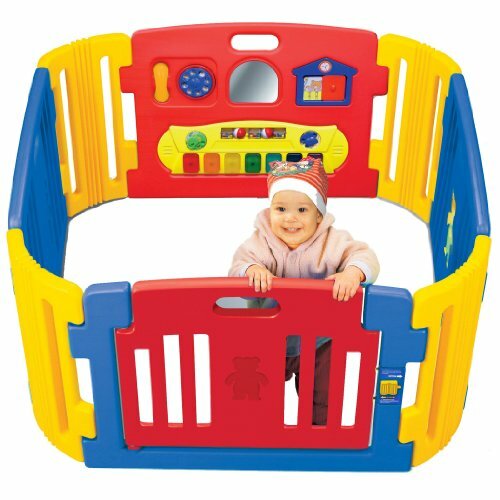 By they time your older one can safely play with these small objects he or she will be able to climb in and out of the playpen but the younger one won't. The playpen will keep all those small Lego pieces safely contained. I'm pinning this to My Wizzley Writing Board. Thank you all for reading this article and taking time to comment! Until we become parents we can't really understand how dangerous are our own homes. Thanks for these tips! VioletteRose, Your selections are well chosen and nicely presented. The door monkey is a great invention. Your list is helpful and actually has applications for other segments of the population, such as seniors or those with serious health concerns. ologsinquito, I am glad you like it! AbbyFitz Yes I too agree its an exhaustive list but knowing these definitely makes things easier! younghopes, I am glad that you found this informative and useful for you! You don't want your child touching that yucky public toilet seat when you are out, do you? Use a disposable toilet seat cover to prevent that. Infants and toddlers can be hard to keep hydrated during hot days out of doors. Here are some tips for keeping your child hydrated all day long.